2nd stage: Premium GAC coconut activated carbon filter - VOCs (volatile organic compounds) and other common chemicals are removed from the water in this stage. 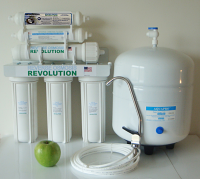 This filter removes chlorine, chloramine, pesticides and herbicides, benzene, trihalomethane (THM) compounds, radon, solvents and hundreds of other man-made chemicals found in tap water, and some of metals including aluminum, cyanide, methane, silver, copper, chromium, strontium, uranium, benzene, nitrates, cysts, radium. cloudiness. This stage removes offensive odors, colors and unpleasant taste. 3rd stage: Premium Carbon Block CTO filter removes chlorine, VOCs, pesticides and herbicides, benzene, trihalomethane (THM) compounds. 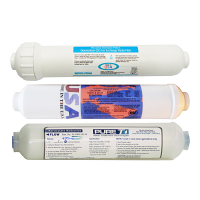 4th stage: Premium High Rejection TFC type Reverse Osmosis membrane (made in USA). 97%-99% of total dissolved solids (TDS) and other elements are removed in this stage. Arsenic, fluoride, lead, chromium, radium, viruses, bacteria, and other unhealthy contaminants are removed from the water. 50/75/100 gallon per day capacity. Made in USA. 5th stage. USA made premium DI bed filter. Made by Omnipure. One of the best DI filters selling in USA. Ion Exchange Process for ultra-high purity water with a minimum TOC background. Decrease level TDS to 0-8 PPM. 6th stage. Premium DI/T33. Filter contents: 1/3 - GAC Carbon for Chlorine, Taste & Odor reduction 2/3 - Premium DI Deionization Ion Exchange Media. The last stage removes any potential remaining unpleasant taste or odor it may have acquired in the storage tank. Filter made by Applied Membranes (USA). Our UltraPure 6-stage RO system is the best RO Water Purification System for water treatment. 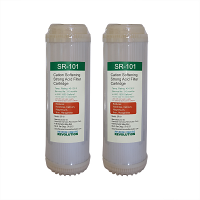 This RO System decreses TDS level from 20-200 TDS to 0-5. Produces ultra high quality water. Ideal for radiation removal. 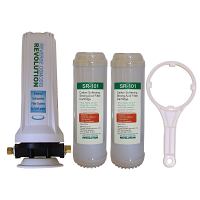 Removes more than 200 dangerous contaminants. 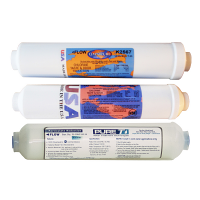 Reverse Osmosis can remove between 85% to 95% of fluoride. For more information on the dangers of fluoride in your drinking water, please visit http://www.fluoridealert.org/faq/. 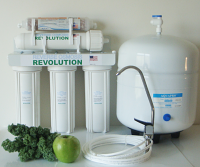 For more information regarding reverse osmosis and pesticide removal, please visit http://www.ehow.com/facts_8333859_reverse-osmosis-remove-pesticides-water.html#ixzz2f7EwjviO. 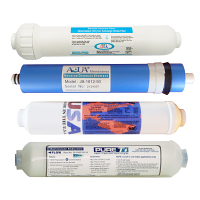 Chlorine, chloromine, aluminum, cyanide, methane, radon, silver, copper, chromium strontium, uranium, benzene, nitrates, cysts, pesticides, radium, sediments, VOCs (volatile organic compounds) , unpleasant tastes and odors are most effectively removed from water with membrane and carbon filters. For more information, please visit http://en.wikipedia.org/wiki/Carbon_filtering. Water is one of the most important factors of your health. We highly recommend to read this USA EPA Water Quality Report about tap water contaminants. We recommend to change filters as following: first 3 stages - every 6-8 months, RO membrane - every 2.5-3 years, post filter (fifth and sixth stages) - every year. We offer special deal! Get extra 24 filter set (good for 6 repalcements or 3 year supply) and save up to 25% versus our regular price. - 1/2" male thread x 1/2" female thread x 1/4" tubing water feeding supply with valve (plastic). - 3/8" male thread x 3/8" female thread x 1/4" tubing water feeding supply with valve. 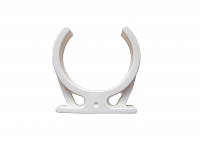 - Garden / Laundry hose adaptor (you can change at no extra cost, link: here , 3/4" thread). - 1/2" thread male x 1/2" thread female tee metal adapter with valve for 1/4" tubing (extra $8.99, link here). - 3-way kitchen faucet diverter ($9.99 extra, link here). Connected directly to kitchen spout. If you want to change water feeding needle saddle valve to another feeding device, please, contact us by email or requested on "Customer notes" section during checkout. Premium package includes all above plus premium RO tubing cutter with collet tool, wrench for membrane housing, extra set of 3 pre filters for only $14.99 (upgrade). The retail cost of premium package is $28.99. We recommend this product to buy as add-on: Water Leak detector with Shut OFF switch for Reverse Osmosis Water Purification Systems. Piece of mind. In case of the water leakage, sensor cuts off the water supply. No power or battery needed. Handling/manufacturing time is 24-48 hours. We ship only via UPS Ground (1-5 business days). Packages: quanity of 2. Weight: aprox 16-19 lbs / 7 lbs Shipping cost: $19.99-$24.99 (Continental US only). If you are located in Hawaii, Alaska, Puerto Rico or other US Territories, please, contact us for shipping quote. 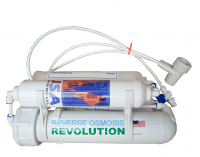 What type of quality can I expect with the Reverse Osmosis Revolution system? We use the same reverse osmosis (RO) technology as many major bottling plants to filter your water. Our system provides you with the refreshing taste of drinking water with a touch of minerals. You won't get the flat taste of distilled water or the stale taste of bottled water which has sat on the shelf too long. Our RO systems purify water daily in your home, on demand, when and where you need it, providing you and your family with naturally fresh and healthy water for all your activities. 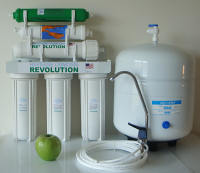 The Reverse Osmosis Revolution system is designed with a 4/5 stage method to deliver the most stable and complete RO process available for water purification in your home. By taking control of your water safety from your own home, you are able to manage the units performance and ensure the purity of the water you and your family consume on a daily basis. Bottled waters are not closely regulated and can come from dangerous or unhealthy locations such as near a dump site or from an unknown municipal water system. You can't know if those areas use lead pipes for water distribution or treat the water with chlorine. You simply cannot know where bottled water has been sourced or how it has been handled. Is RO filtered water any better than my tap water? It is a known fact that many municipal water distribution channels in cities across the country are in desperate need of replacement due to wear and the advanced age of the system. Water is vulnerable to contamination at almost any point along the delivery route. Unsafe lead and copper pipes, bacteria from water main breaks or stagnant water, and any number of other hazards are a real possibility with municipal water systems. Most municipal water systems include chlorine or chloramine to disinfect the water before it reaches your tap. These additives can cause health issues as well as give water an unpleasant taste or color. Fluorinated water has become common in cities large and small across the United States. Many modern medical studies point to these chemicals as poisons and cite adverse reactions for those with compromised immune systems, the very young and the elderly. Isn't bottled water the best choice for pure, clean water? Many people are surprised to find out that bottled water is no guarantee of purity or safety. Approximately 40 percent of bottled water is simply regular tap water, which may or may not have received any additional treatment or filtration. That means all your time and effort in driving to the store, selecting a top brand bottled water, and storing the water in your home, may be for nothing other than the regular tap water from another city. Surprisingly, most municipal tap water systems must adhere to stricter purity standards than the bottled water industry. Large public water suppliers, such as a city or town, are required by the EPA to test for contaminants up to several times a day, but the FDA requires private bottlers to test for contaminants only once a week, once a year, or once every four years, depending on the contaminant. Many bottled water users are shocked to find out that both tap and bottled water can have fluoride. Some bottled water companies are using the addition of fluoride as an actual selling point. You cannot be sure of the quality of your bottled water unless you can see the water test results for yourself. Most companies will not provide the public, independent researchers or their customers with access to any information regarding water testing or quality. Another point to consider is the plastic bottle big name companies use to store their water. All of those disposable water bottles have a huge impact on the environment and our landfills. Depending on how long bottled water is stored, before and after you purchase it, contaminants from the bottle itself can leach into the water.